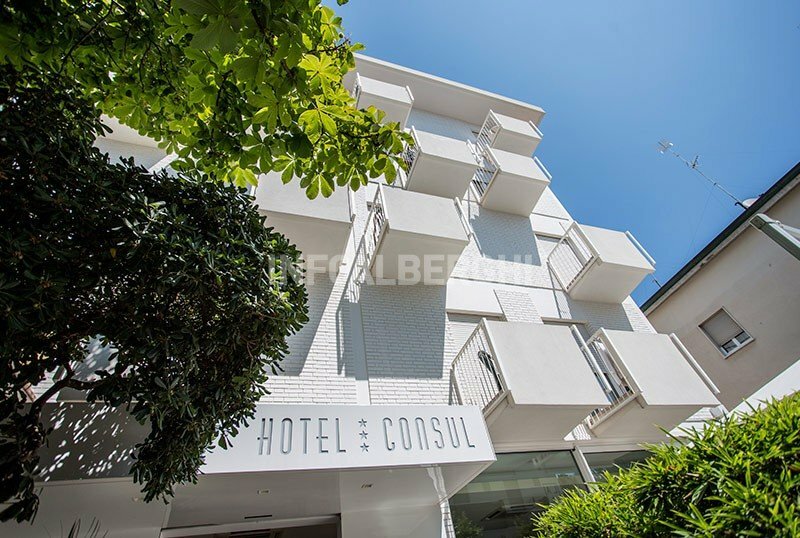 The 3-star Hotel Consul in Riccione offers numerous services for children, including a pediatrician and a mini-club. Equipped for cyclists, it has private garage, WI-FI, air conditioning and disabled facilities. Pets allowed with extra charge. The structure is located in Riccione in a quiet area, 5 minutes walk from the beach and about ten minutes from Viale Dante. The hotel offers recently renovated rooms, all equipped with parquet flooring, beds with slats, independent air conditioning, telephone, TV with digital terrestrial, minibar, safe, private bathroom with hairdryer and courtesy set, WI-FI included in the packages Quality and Executive. Some rooms have a balcony. ECONOMY: sober rooms, French bed (one and a half square), private bathroom with bathtub, window, soundproof windows. STANDARD: they can be single, double / twin, triple and quadruple. They have a bathroom with a shower or a shower with a bathtub. They are served by a dedicated lift and can comfortably accommodate people with mobility difficulties. FAMILIES: available in hotels several solutions for groups and families including "connecting rooms" with private entrance and "rooms offered", double rooms to which are added single or bunk beds (limited availability). The hotel has a bar, a TV lounge, a lift, a reading room and a laundry service. The hotel is equipped for cyclists and allows the rental of bikes for a fee. PARKING: covered and uncovered subject to availability, both subject to charges. CONVENTIONS: beach, amusement parks, gym, nightclubs. SERVICES FOR DISABLED: entrance on the ground floor with inclined ramp, lift for disabled people, rooms with wheelchair maneuvering space, bathroom with shower accessible. BREAKFAST: international buffet, homemade cakes, muffins, donut, biscuits, croissants, yogurt and fruit. LUNCH AND DINNER: cuisine inspired by the Mediterranean tradition, with the use of seasonal products. Three menus to choose every day, buffet opening with vegetables, salads, hot and cold appetizers. Drinks included with meals (water, soft drinks and house wine) in the Quality and Executive packages. VARIATIONS: gluten-free cuisine and vegetarian cuisine available. In the hotel: bicycle seats, baby-sitting service (for a fee, on request), pushchairs, outdoor playground area, entertainment for meals (July and August months), baby / mini club, pediatrician. In the room: refrigerator to store milk and homogenized, fall protection rails, camping beds, crib, bath tubs, toilet adapter. At meals: early opening of the restaurant, baby food service, baby menu, baby seats, saucers and plastic cutlery. On the beach: nursery, games, mini club, small library, entertainment, bracelet with the identification of the bathing establishment. The Hotel Consul has an agreement with the nearby baths 110, 112, 115, 121. At guests' disposal: entertainment, playgrounds, ping-pong and table football, hot and cold showers with hair dryer, cabins for free use, equipment for the disabled . The Bagno 110 also has a heated swimming pool, hydromassage, hydromassage beds, massage area, relaxation area, reading area, safety deposit boxes. At Bagno 115 there is a small gym, WI-FI, bicycle and scooter parking, buggy and pedal boat rental; the establishment welcomes dogs. The prices shown above are for a minimum stay of 7 nights. - All quotations and accommodation reservations optioned with specific customer request will be guaranteed for 24 hours. After this deadline, the hotel management will resell the unconfirmed rooms by paying the deposit. - For periods of less than 7 nights, a supplement may be applied at the discretion of the management up to € 15.00 per person per day. - After 31/04 the rates shown may vary according to the availability of rooms in the chosen period. - Executive treatment includes 1 umbrella and 2 sun loungers at one of our affiliated baths (bathrooms 115, 112 and 121), excluding any type of paid service provided by the bathroom (eg swimming pool at the bathroom 112). Children 0-4 years: Free in room with parents! Hurry! The offer is limited and only a few rooms remain available! Children from 0 to 3 years (in bed with 2 adults): FREE!